What? I forgot to share my favorite hummus recipe? I’m so ashamed of my procrastination. Or maybe it’s my senility. Can one be senile at thirty-four? I even have a picture. A two-year-old image from those early food styling attempts. Ok, I’m still attempting I admit it. I think what happened is I wrote a different hummus recipe for Newman’s Own about the time I wanted to post this one. Obviously, I then became confused and forgot to share. It wouldn’t be the first time! So, without any further convoluted ramblings here’s that long overdo much loved hummus recipe. 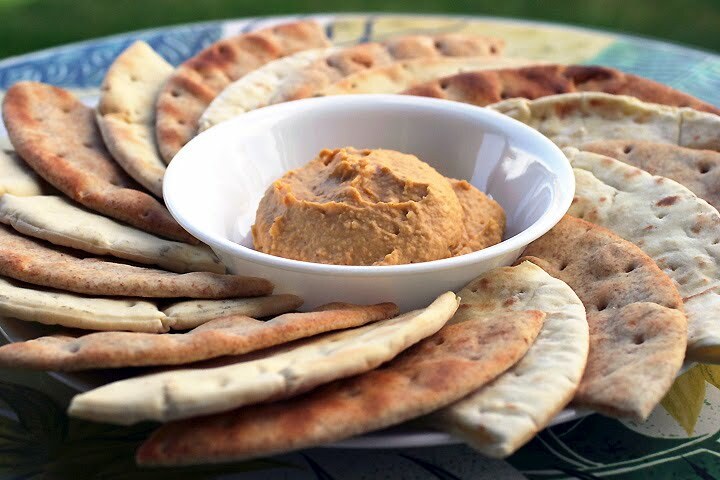 Tomato paste gives it a nice full mouth richness and the garlic, lemon juice and cayenne make me never want to stop slathering thick layers of this yummy bean spread over charred pita wedges with sweet red pepper slices on the side. Missy, where are my cane and keys? I need to buy more garbanzo beans! With a food processor, homemade hummus is five minutes of prep away. Well, five minutes and an hour in the fridge! Rinse garbanzo beans until the foam is gone; strain well. Place beans into a food processor bowl. Add the rest of the ingredients and puree until smooth, scraping the bowl as needed. For better flavor, please give this hummus some time to meld together by covering and refrigerating for an hour or more before serving. Heat the grill to medium and warm the pitas directly on the grill until light grill marks form, about a minute or less. Turn over and repeat. Remove the pitas from the grill and cut into wedges. Serve with hummus. FAB-U-LOUS. I am such a hummus fan. In fact I have really been thinking of making some more (I did a sweet potato one recently that I'm just finishing up) so this will be up next! I love hummus, and this recipe seems easy for me to make. Thank you dear friend for sharing. I love humous! Though I haven't tried a tomato type. Love it with cucumber and carrot sticks. Never tried it with pitta bread but I imagine it'd be great! Ahhhhh, hummus... that yummyness that we both love (of course). If you have sundried tomatoes in a jar handy, and I would imagine that you do, they also make a delicious addition. Cubed feta and pitted kalamatas and you've got appetizers worthy of a good bottle of wine. Can't wait for you to come play in Bozeman! Sounds delicious! I love hummus and anything garlic and tomato is good in my book... Excited to try this one! Thanks for sharing the recipe! The good news is...I'm pretty sure you can't be senile...yet. The bad news is...I have no garbanzo beans in my house with which to make this! Yikes. Need to get to the store. Lol - I have tons of photos of recipes that I haven't blogged yet. Someday I'll get around to it. Love, love, love your photo!! My hubby claimed he only liked our homemade hummus plain... then I started experimenting and mixing different flavors and he went nuts over them, too! And I've got TONS of pics/recipes I haven't blogged about yet. Thanks for reminding me! LOL! I love the hummus at the grocery store with the roasted peppers or other toppings, but I hate the price I have to pay for them. I'm sure I could whip up this recipe easily, with my own toppings, and enjoy it that much more! YUM! This sounds so amazing, Laura! I just know I'd love the tartness from the tomatoes. I just bought a food processor...I could break it in with this! It's printing right now:) Thanks, Laura! I have yet to find my favorite recipe, so I'm super eager to try yours! I bet the tomato paste adds such a kick of flavor. Thank you so much for sharing with me tonight...and thanks for all the sweetness you leave on my blog...it means so much to me! Hummus is Working Girl's go-to lunch at the office... She would love this! I am going to make her a batch for a surprise! This sounds delicious! Laura, do you know how long tahini keeps in the fridge? I have a can that I bought over 6 months ago. I just figured it would be the kind of stuff that keeps FOR-EVAH! But it has no expiration date. :( It's not a good investment to pay $6 for a huge jar of something you only use a teeny bit of at a time!